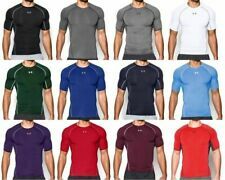 Under Armour Heat Gear. Color - royal blue. 100% polyester. Made by Under Armour, this shirt is a great find! It is a red polo with an embroidered white Under Armour symbol on the left chest!It has 3 buttons, a collar and short sleeves. This polo is from the Heatgear series and has a loose fit! Under Armour Heat Gear. Regular Fit. Color - Pink. COLOR: GRAY WITH BLACK LETTERING. SIZE: XLARGE. Chest 29" - (Arm Pit to Arm Pit). Height 31" ( Does Not Include Collar). Shirt is 88% polyester and 12% elastane. Logos are screen printed. It's black, lightweight with a fine rib collar and the graphics are silkscreened. New ListingUnder Armour Heat Gear LOOSE Coupe Lache Mens XL Gray S/S Polo Shirt ~ NEW! Top to bottom is 32". Get Supersized Images & Free Image Hosting. Armpit to armpit is 24". Under Armour Heat Gear. Compression Fit. 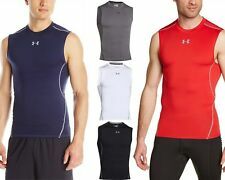 UNDER ARMOUR HEAT GEAR FITTED SLEEVELESS ACTIVE WEAR BLUE/GREEN TOP MENS LARGE. Condition is Pre-owned. Shipped with USPS First Class Package. Mens Under Armour Heat Gear Loose Fishing Long Sleeve Shirt Size large. This shirt is in very good preowned condition. See pictures. The shirt you see in the pictures is the shirt you get. Comes from a clean smoke free home. PayPal only. Ship to the USA only. Thanks for looking and bidding. GRAY LOSSE HEAT GEAR SEE ALL PICS. Exceptional condition. Condition is Pre-owned. This is a really nice Under Armour Short Sleeve Athletic Shirt. It is in very good condition. Shirt is free of any stains, tears, or holes. Style: Heat Gear; USA Flag. Black / Gray: 19 " Armpit to Armpit 28" Neck to Tail. Under armour Mens Size Small Marvel The Punisher Logo Tee Heat Gear. Condition is Pre-owned. Shipped with USPS First Class Package. Like new!!! Under Armour Heat Gear Loose Tee T Shirt Men's 2XL XXL Gray. Condition is Pre-owned. Shipped with USPS First Class Package. UNDER ARMOUR HEAT GEAR SHORT SLEEVE ORANGE POLO SHIRT MENS SMALL EXCELLENT COND. Shirt is 95% polyester and 5% spandex. Logos are embroidered. New ListingMens Large XL Under Armour ls black loose heat gear 1/4 zip pullover shirt. Mens Large XL Under Armour ls black loose heat gear 1/4 zip pullover shirt.. Condition is Pre-owned. Shipped with USPS First Class Package. Lot of 4 shirts! Adidas has been wore once,both Nike are fitted,blue wore once,neon green my favorite,lil stains. Cheap price,free shipping! Length: 27 " (shoulder to hem). Chest: 20" (underarm to underarm). UNDER ARMOUR. FIT SHIRT. WIDTH: 23". EXTRA LARGE BLACK SHORT SLEEVE. LENGTH: 31". It is made of 100% Polyester. It is in good used condition! It shows normal signs of wear. Mens Under Armour Wrestling Heat Gear 1/4 Zip Shirt Pullover Small S. Condition is Pre-owned. Overall good condition with some cracking in the decals. Shipped with USPS First Class Package.